As of this fall, I'll be celebrating 10 years with one of PMG's oldest accounts, Management Mentors. I work directly with owner/founder Rene Petrin along with his sales team, IT team, and admin team. HAPPY ANNIVERSARY TO US! Getting into a regular "content creation" rhythm. Rene is one of the eminent mentoring experts in the country, but he was so busy running his business, he didn't have time to sit and write. Creating a user-friendly website experience and an overall look and feel that reflected the Management Mentors brand. Increasing Management Mentors' overall exposure. Increasing website traffic and converting visitors into leads. One of the coolest things about Management Mentors (beyond its awesome mentoring software) is that it was one of PMG's first clients to transition to HubSpot in early 2009. Check out the site visits graph below. We've come a long way, baby! Some of the nitty gritty in case you can't make it out: During March 2009, the site received 1,320 organic visits and 2,572 total visits. A little over seven years later (May 2016), the site received 33,501 organic visits (42,000 total visits) resulting in 407 contacts. So, how'd we do it? How'd we go from just a little over 2,500 website visits a month to over 42,000 visits—visits that have resulted in all the awesome activity bulleted above? First, and foremost, we knew it would take time. We started consistently hitting 30,000+ total visits in early 2014. So that "jump" took five years of consistent building. This is something we like to stress to new HubSpot customers. HubSpot isn't a panacea to all your marketing pains. It is an incredible tool, however. And when you use it wisely and diligently, HubSpot can produce great results over time. But that last part—over time—is an essential point to keep in mind. All that said, allow us to pull back the curtain and show you how PMG and Management Mentors continue to rock HubSpot marketing. We follow HubSpot best practices. When Rene decided to move his site to HubSpot, PMG was just starting out on the software, as well. As a result, we devoured everything HubSpot wrote about its products, inbound marketing, site optimization, and so forth. We followed their best practices. And guess what? Those practices worked. Sounds simple, doesn't it? But you’d be surprised at how many companies STILL overlook the basics of good website optimization, as well as other best practices regarding inbound marketing. We write stuff that people like and want to read. Rene consistently receives compliments from customers and prospects about the breadth and depth of his site, including how enjoyable it is to read and understand. We definitely have a lot of fun with the content (check out the cheeky newsletter sign-up page), but we also provide deeper content with lots of meaty info, like this blog post. We keep up with HubSpot's new products. The HubSpot we first encountered in 2009 is completely different from the HubSpot of 2016. HubSpot is constantly improving its product and adding on new functionalities. This requires us to learn new tools, including how to effectively implement them, monitor them, and so forth. We don't shy away from changes—we welcome and embrace them. We're mindful about the HubSpot features we focus on. It's impossible (and probably not wise) to implement every new product or feature the minute HubSpot rolls it out. My approach for Management Mentors? Great content drives most of the conversions on Rene's site, so if the new product or feature is content-related (e.g. when lead nurturing transformed into workflows), I typically pounce sooner rather than later. But I'll wait before trying out other product enhancements. We admittedly don't use every HubSpot feature, nor do we need to. We learn from the best. Some of our favorite hacks are the ones HubSpot discovers and shares. For example, the Management Mentors blog subscription EXPLODED when we added an opt-in on all forms, a hack we learned how to implement step-by-step here. We constantly tweak and adjust. Rene's business goals have changed over the last decade and so has the competitive landscape. The key to effective marketing involves knowing when to make adjustments. We keep our eyes on the analytics and the numbers that matter most to Rene and his company's bottom line. We communicate regularly about these things and adjust our strategies, as needed. We also do more of what's working. As our blog subscriber base grew, we realized Rene's audience was hungry for regular, digestible articles—the "news you can use." So we started blogging more in late 2015 (but we made sure we had a strategic approach). The result? Between Jan 1 and the end of March 2016, Management Mentors' blog subscribers increased by 20% and blog posts were viewed over 31,000 times. Woot! We know how to work with teams outside of marketing. As I mentioned earlier, we work with Rene's sales team, IT team, and admin team (and some of these folks are on different continents). This has been critical to Rene's success—the team players are on the same page, and sales and marketing work in harmony, which is important (smarketing at its best!). Remember, when it comes to HubSpot marketing, slow and steady wins the race. The leads won't come flooding in overnight, but with diligence, smart strategies, and patience, you can rock HubSpot, too. And, of course, if you need some help, we're always here. Let's chat about your HubSpot marketing needs! 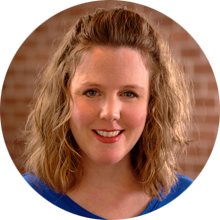 Robyn Bradley has been a Content Marketer for PMG since 2006. When she’s not writing, she’s…oh, wait, she’s always writing! She loves integrating real experiences with real clients into her blogs and translating them so that any business can benefit from reading. Complete with her world-famous laser-focus, you can find her crafting articles that help other people in the marketing world find success.